Janis Albrecht, far more than a Professional Ski Patroller, caught at Whaleback doing what she loved most! Janis Albrecht, 60 years old, passed away peacefully May 10th 2018. Raised in Fairfield CT, graduated class of 1975 Andrew Warde High School. A longtime resident of Gaysville, VT.
Janis was a professional Ski Patroller, EMT and volunteered with the adaptive ski program for people with disabilities. 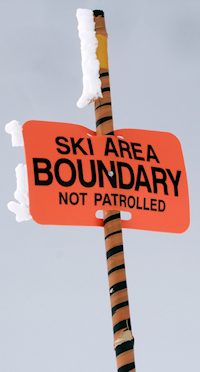 She patrolled at Killington Resort, managed the Mountain Ambassadors then took over as Patrol Director for a few. During the summer months, she worked with the horse show circuit. Janis loved traveling, adventure, hiking, sailing and being with family, friends and her dog. She loved going to concerts and music festivals from Jazz Fest, Bluegrass, Grateful Dead shows, and Zydeco. Janis was a happy, caring, joyful person who loved to have fun and filled her life with wonderful experiences. Ski Patrollers and ski area customers will remember her ever-present smile. She will be dearly missed by her family, her friends, the Ski Patrolling community and never forgotten. 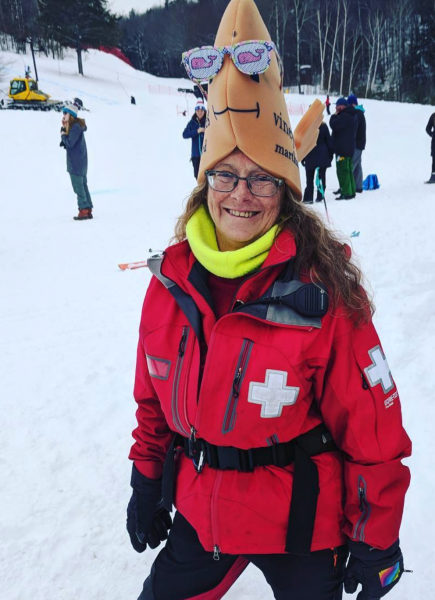 She will be missed by Whaleback — the Ski Patrol will hold a “Celebration of Life for Ski Patroller Janis Albrecht” at Whaleback Mountain in Enfield NH (exit #16 off I-89 in New Hampshire) on Sunday, September 16, 2018, at 1 PM. Please consider making donations to the Eastern Division Ski Patrol Memorial/Scholarship Fund in Janis Albrecht’s name.